The Library of Congress brings booklovers an enriching tribute to the power of the written word and to the history of our most beloved books. 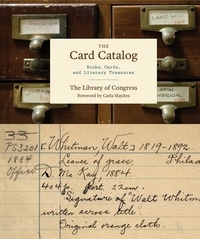 Featuring more than 200 full-color images of original catalog cards, first edition book covers, and photographs from the library's magnificent archives, this collection is a visual celebration of the rarely seen treasures in one of the world's most famous libraries and the brilliant catalog system that has kept it organized for hundreds of years. Packed with engaging facts on literary classics--from Ulysses to The Cat in the Hat to Shakespeare's First Folio to The Catcher in the Rye--this package is an ode to the enduring magic and importance of books.